Adr ienne was struggling. With employment. With finances. With a destructive relationship that caused her to doubt her self-worth and her ability to provide for her children. 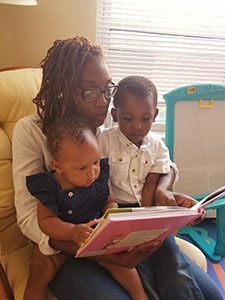 For her own survival and the well-being of her two little ones – a 10-month-old daughter and a 3-year-old son – she knew her life had to change. “I had to break away,” she says, “to find myself and rediscover my purpose, because I felt like I was making the same mistakes over and over again.” But where would she go and how would she provide for herself and her children until she could stabilize her life? She prayed to God for guidance, thanking Him in advance for helping her find a solid solution. Then she called 211 to locate safe shelter and was directed to Bridgeport Rescue Mission, where she was accepted into our faith-based life recovery program. When she was shown to her room with a poster on the wall that read “YOU ARE SO LOVED,” she knew this was where God wanted her to be. Here, through your gifts, she and her children are blessed with the essentials of safe shelter… nutritious meals… vital clothing… and everything they need to feel comfortable and at home. And with staff’s guidance and encouragement – and the structure of our comprehensive curriculum – she is growing stronger in every area of her life. “The Mission helps you with a plan so that when you leave, you’re never in a position to be stuck in the same predicament,” she says. And she’s learned the foundation for that plan is to trust in the Lord.